Botanical Name: Ricinus communis. Extraction Method: Cold Pressed. Obtained From: Seeds. Organic: made without pesticides, GMO’s, or hexane. Ingredients: Castor oil, 100% Pure with NO additives or carriers added. Description: Castor Carrier Oil is one of the few oils that can be used as an emulsifying agent. It also acts as a protective barrier on your skin that will protect against harsh environmental conditions. Color: Pale yellow to golden yellow liquid. Aromatic Description: Castor Carrier Oil has very little scent characteristic of most carrier oils. 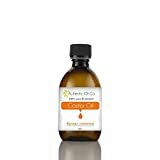 Common Uses: Castor Carrier Oil is used in massage therapy, aromatherapy, and in manufacturing (particularly as a conditioning agent in hair care products). Castor oil has many properties that make it perfect for use in cosmetics. Grabbing moisture from the air and holding it close to the skin is one such use. Cosmetic manufacturers use castor oil as a humectant to keep moisture close to the skin’s surface due to its water-binding abilities. In certain cosmetic products, castor oil actually thickens the mixture allowing the ingredients to remain more stable. In soapmaking, although castor oil would appear to require less sodium hydroxide, it sometimes requires more due to its high ricinoleic acid content. The gentleness of castor oil is another welcome characteristic. Unlike number synthetic ingredients that irritate or cause inflammation of the skin, castor oil is considered gentle. Skin irritations or allergic reactions do not often occur with the use of castor oil which makes it a prime choice for makers of cosmetics. Castor oil provides quality protection for your skin to keep it healthy. Consistency: Typical and Characteristic of Carrier Oils. Absorption: By design, Castor Oil will remain on the surface of the skin, acting as a barrier. This entry was posted in Organic Health Products and tagged 10ml, Castor, Organic by Organic Health. Bookmark the permalink.